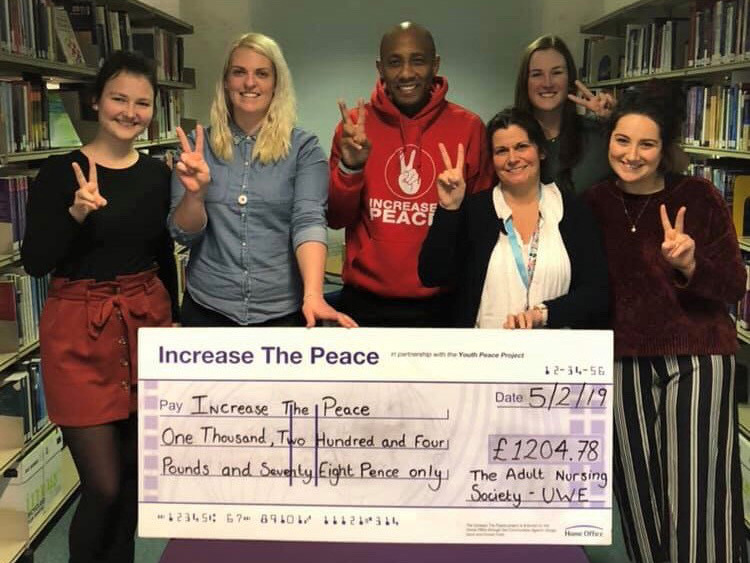 The Adult Nursing Society at Gloucester Campus raised £1,204 for local initiative Increase the Peace (ITP), which works to promote peace and divert young people away from anti-social behaviour, gun and knife crimes and gang affiliation. They raised the funds by holding a bake sale, pub quiz and raffle and by one society member, Jocelyn, completing the Cotswold Challenge in aid of ITP. "The money raised for Increase the Peace will go towards delivery of our Impact workshop. This is a workshop designed for secondary school age young people and helps teach them about the consequences and dangers of knife crime, to raise awareness of knife crime, gangs and drugs. The workshop takes an early intervention and prevention stance and is a socio-educational programme providing opportunity for young people to think and talk about issues affecting them today in a safe and secure environment whilst being interactive and inclusive. The money will also help increase the Peace to continue to support children and young people with their social, behavioural and personal development."